Monika Rosborough-Bowman is currently Faculty at Utah Valley University and cellist with the Ballet West Orchestra, Orchestra at Temple Square, Cathedral of the Madeleine Players, Utah Lyric Opera, and the Utah Baroque Ensemble. She has performed with the Utah Symphony, Utah Chamber Artists, among others, and is a regular recording studio artist. She has performed and recorded with artists Andrea Bocelli, Bryn Terfel, and many others. Recently she has recorded Handel’s Messiah with the Mormon Tabernacle Choir and Orchestra. 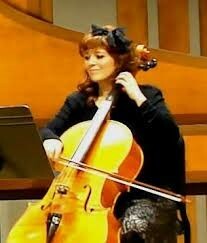 Monika has a Master’s degree in Cello Performance and Pedagogy from Brigham Young University. She has performed throughout most of Western Europe, with solo recitals in Utah as well as Switzerland and her native Italy. Previously, she has served on the music faculties of Brigham Young University-Provo and BYU-Idaho and has coached and directed at several youth music ensembles and festivals. Monika enjoys performing and recording music with her husband and four children, who are also professional musicians.